Have you made your New Year resolution yet? Aren’t there things that you need to change or goals you would like to achieve? With New Year’s Day coming up, the question about the New Year’s resolution(s) is quite common. It is that time of year that we all tend to make decisions to either reform our old habits or achieve new goals. One of my New Year’s resolutions this year is very simple, realistic and attainable, so it would be embarrassing if I cannot keep it. I decided that every once a week no matter what, I will be making a dinner, set the table with fresh flowers and wine, and take time to enjoy the dinner and keep the happy conversation going on throughout the dinner. I know that some of you out there do not have to make such a decision, because you have this thing ongoing on a regular basis, but I realized that I had departed from that routine for quite some time. Lately, I have become kind of lazy and even though my husband and I cook and bake regularly, unfortunately I am not taking time to set my table in a manner which would allow us to enjoy our dinning time more, be it visually or conversation vise. 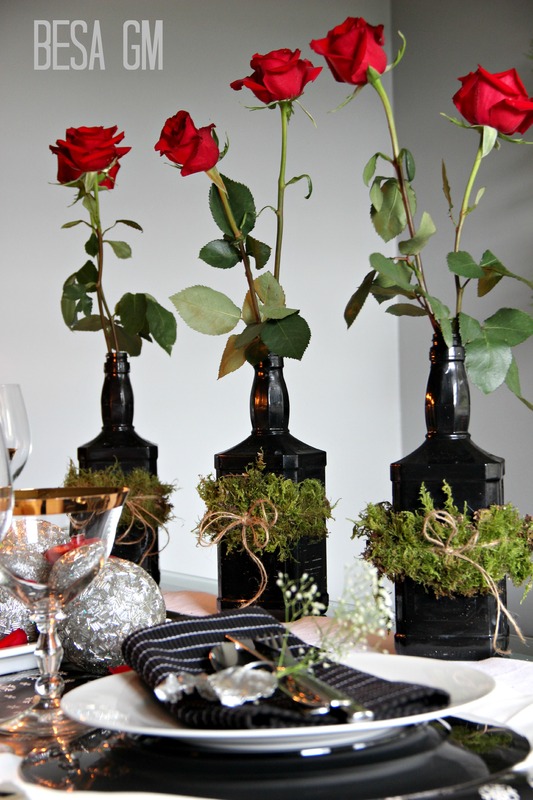 I will start my New Year’s resolution on the New Years Eve with this very simple, nature inspired and romantic dinner table setting. 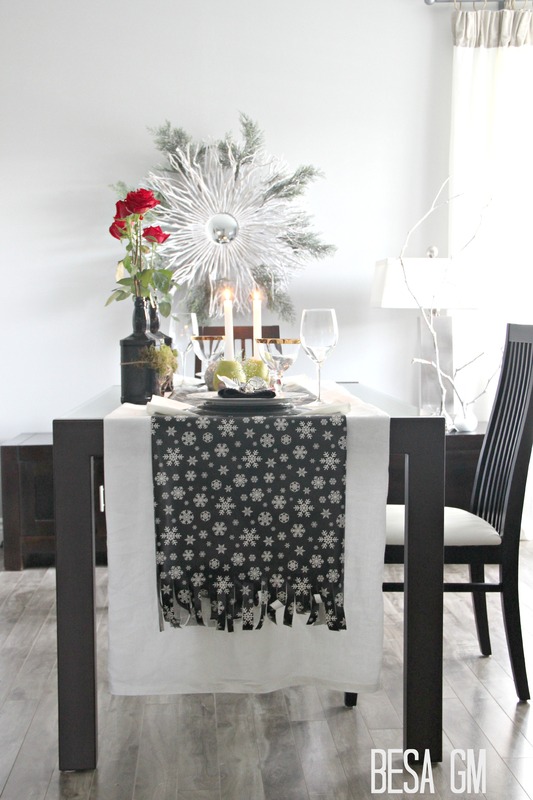 To achieve this look I used a white tablecloth on top of which I put a black and white wrapping paper as a runner. 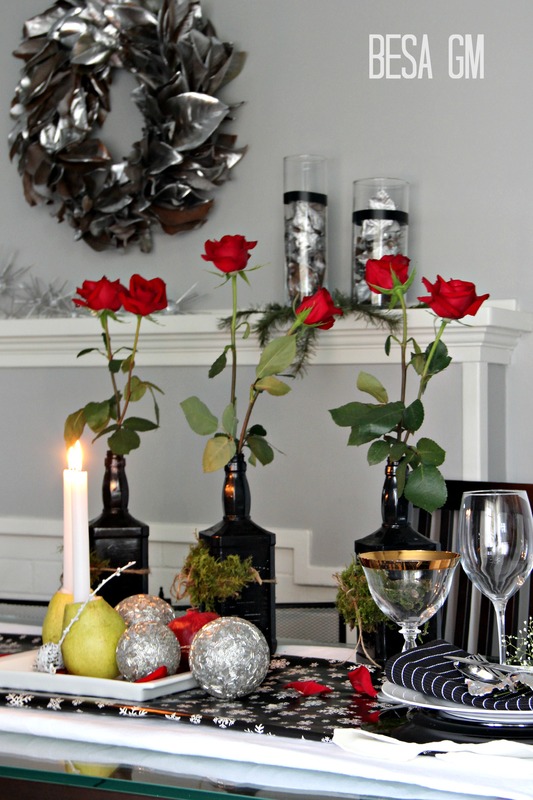 Very simple and informal, but it added a very festive, elegant, and chic look. 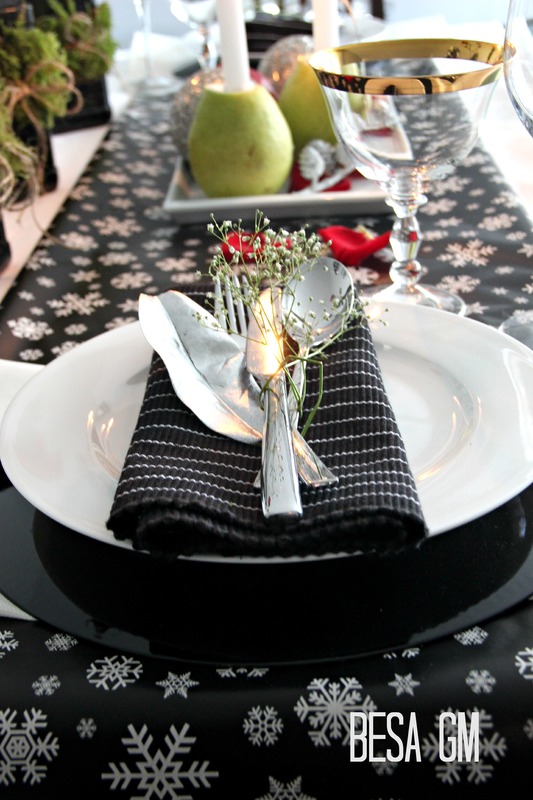 When it comes to informal and fun dinner gatherings, using wrapping paper or other decorative paper products for table setting proves to be a very affordable option of achieving elegant and modern look in an instant. 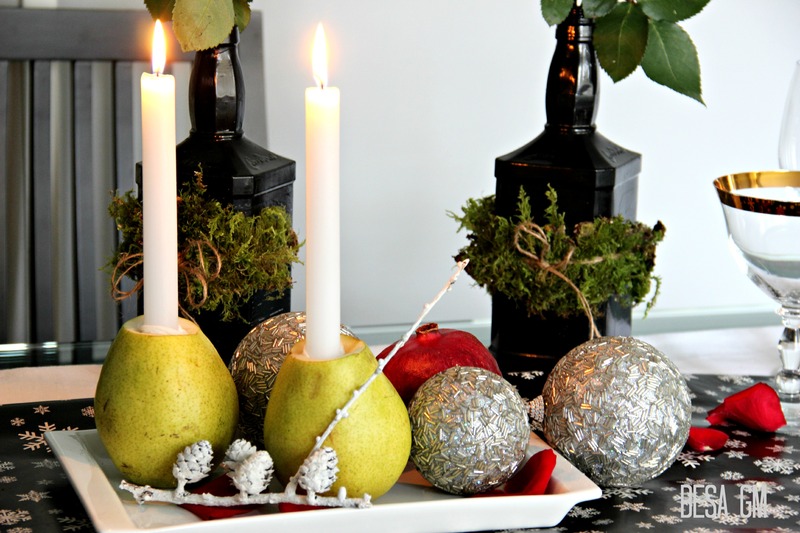 For a centerpiece I made these two pears to serve as candleholders. 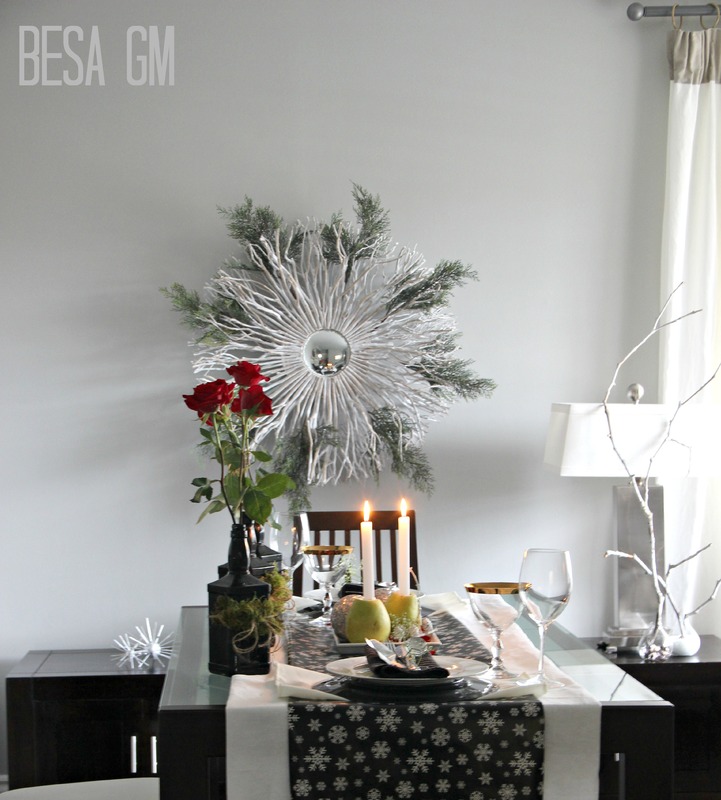 I placed the pear candleholders on a white porcelain tray and added some silver ornaments. For layering and a fuller look, I placed a white place-mat under the charger and the striped black/white thick napkin on the plate. 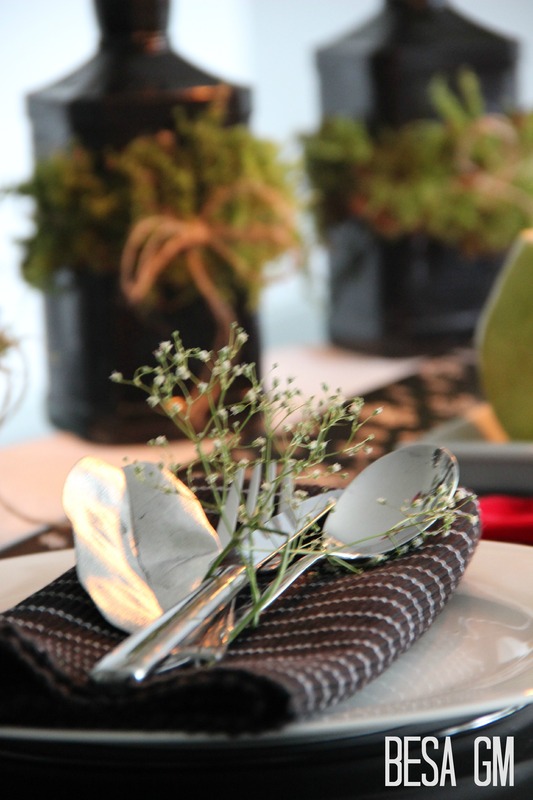 For some festive sparkle I added silver leaves on top of the napkin and tied the cutlery with fresh baby breath. 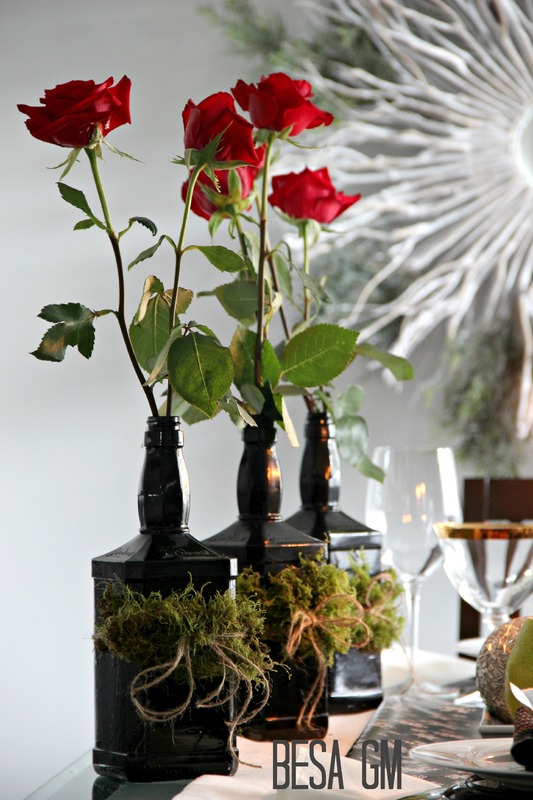 I wanted my New Year’s table to include things that we love and enjoy all year around, so I collected some moss from our walking route and tied it around the black painted whisky bottles.I enjoy the mossy walking route with our dog, and my husband enjoys a glass of scotch on the rooks in the evening by the fire, so topped with my favorite red roses this floral arrangement became a very appealing and will add a romantic touch to our New Year’s Eve table setting. I already started loving my New Year’s resolution, and I will do whatever it takes to keep it alive. It is so easy, effortless and so much fun, and for now I do not see a reason which could prevent me of keeping it going. Have you decided to make any New Year’s resolution this year and, if so, what is yours? Such an attainable goal you’ve set for yourself and it looks like you are off to a very good start. Love your table setting, and what a nice resolution, we eat dinner together here very often, but not so much seated around a properly set table, that would be a nice thing to start. 🙂 Happy New Year! 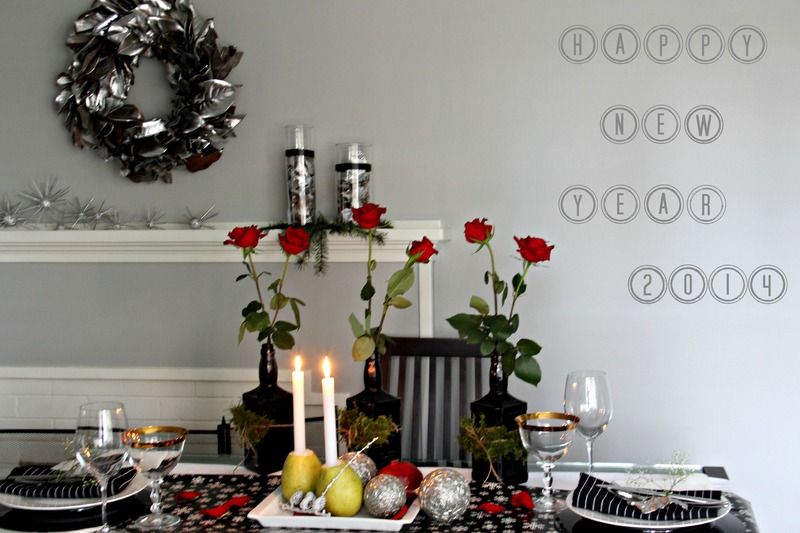 Happy New Year to you too, and thanks for stopping by my blog and taking time to comment.